At a rally in Jammu and Kashmir's Kathua, Modi alleged that the opposition party is raising questions on the government's actions on national security to appease their vote bank. Prime Minister Narendra Modi on Sunday said there is a “more” powerful wave across India in favour of the BJP as compared to that in 2014 and it is now “difficult” for the Congress to “survive”. Modi was in Jammu and Kashmir’s Kathua district to campaign for Minister of State in the Prime Minister’s Office (PMO) and the BJP’s Udhampur Lok Sabha seat candidate Jitendra Singh. “I have visited the entire country. Since I came first to Jammu (last time), since then I have visited several states. I have seen a more powerful wave (in favour of the BJP) this time as compared to 2014 (Lok Sabha polls),” he told an election rally here. 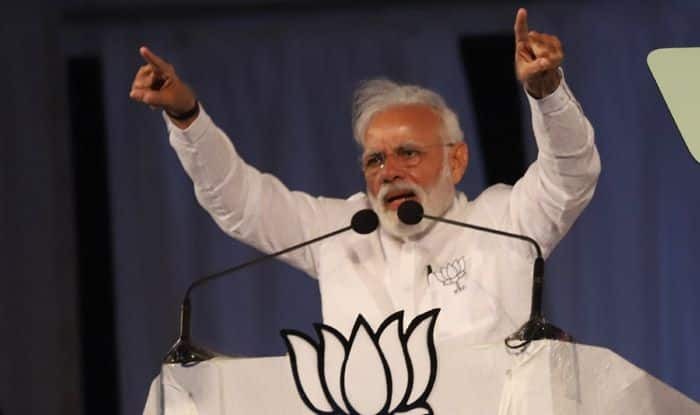 Modi, attacking the Congress, alleged that the opposition party is raising questions on the government’s actions on national security to appease their vote bank. “You have seen the surveys these days (on TV and in newspapers). One thing is clear from these surveys — the possibility of Congress getting number of seats. BJP has a possibility of getting three times more seats than that. This is what people conducting the surveys are saying,” he said. Therefore, it is difficult for the Congress to survive, Modi claimed. Politicians and elections will keep coming, but the nation is supreme and will remain supreme. Nationalism is the soul of the nation, he said. But, for some people, nationalism is an “insult” and they keep raising questions on a daily basis as to why Modi is talking about security of the nation, the prime minister said. “It is important to talk about the nation, because you get to know what some people want to do to this country. When I talk about nationalism their masks fall off, (and it shows) where they stand?” he said. Modi also hit out at Punjab Chief Minister Amarinder Singh for skipping Saturday’s event to pay respect to those killed in the Jallianwala Bagh massacre 100 years ago. The massacre took place at Jallianwala Bagh in Amritsar during the Baisakhi festival on April 13, 1919, when troops of the British Indian Army under the command of Colonel Reginald Dyer opened fire at a crowd of people holding a pro-independence demonstration, leaving several dead and scores injured. Singh has “insulted” the Jallianwala Bagh memorial by not attending the government’s memorial service on the day of the incident’s centenary, Modi alleged. “Congress CM (of Punjab) was absconding from the function. He boycotted it, because he was busy in ‘bakhti’ of the Congress ‘parivar’ (family). He went with ‘naamdar (dynasts)’ but not with India’s vice president”, he said. “Was it not a insult to the martyrs?”, Modi asked the rally. Vice President M Venkaiah Naidu had visited Jallianwala Bagh in Amritsar Saturday and paid tributes to “martyrs” on the 100th anniversary of the British colonial era massacre. The prime minister also hit out at the Congress for questioning the Balakot airstrike and the surgical strikes. “Why did the Congress get impatient after listening about the surgical and air strikes? Why died they get rattled. Every Indian is proud of its security forces for the strikes”, he said. The Congress never had faith in the country’s armed forces and they have doubted the capacity and capability of the military, Modi alleged. “They have never understood the power of the army. We are using the power for the armed forces for the security of the nation. For the Congress, the army is only a way of earning money,” he said mentioning the Bofors scam. Modi alleged that the Congress talked about the surgical and air strikes to hide their failures. The prime minister paid tributes to B R Ambedkar on his birth anniversary. “I will carry forward the initiative in the future too,” he said. Modi also slammed the Abdullahs and Muftis, saying the two families “ruined” three generations of Jammu and Kashmir and he will not allow them to “divide” India.